You are here: Home » MEDIA » Books » The Hitch Hiker’s Guide To The Galaxy: The Nearly Definite Edition by Douglas Adams (book review). 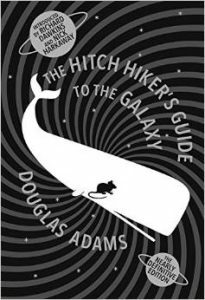 The Hitch Hiker’s Guide To The Galaxy: The Nearly Definite Edition by Douglas Adams (book review). Summarising the quintet of comic novels that make up this collection of ‘The Hitch Hiker’s Guide To The Galaxy: The Nearly Definitive Edition’ is difficult and probably redundant anyway. Most Science Fiction fans will have read at least the first book or two and to say they’re funny (in a very English way) is an understatement of the grossest sort. Indeed, Adams was a bit of a genius, one of the very few people able to be intelligent, satirical and humorous all at the same time. Truly funny sci-fi or fantasy has never been easy to do, perhaps because the more you suspend disbelief, an essential part of enjoying Science Fiction, the easier it is for a clumsy joke or awkward situation to make the whole story completely unconvincing. Very, very few authors are able to write comic sci-fi well and even fewer of them have been commercially successful. Adams was an exception though, one of the most popular and influential writers of recent years (he died, not quite 50, in 2001) as well as one of the most prolific. Besides his books, he wrote TV and radio scripts, which probably goes a long way to explain his excellent sense of comic timing and drama. Among his literary output were the five instalments of the ‘Hitch Hiker’s Guide’ (of which more shortly), a couple of Dirk Gently books, a bestselling book about animal conservation and the scripts for several ‘Doctor Who’ stories. ‘The Hitch Hiker’s Guide To The Galaxy: The Nearly Definitive Edition’ is not the first compilation of ‘Hitch Hiker’s Guide’ novels, but it is probably the most complete. It includes two introductions, one by well-known science communicator Richard Dawkins and another by novelist Nick Harkaway. Dawkins’ piece is exactly what you’d expect: it’s a short but affectionate essay from a famous fan who became a friend, two men from the same generation and background who shared many interests and a few frustrations. The Harkaway piece is more difficult to explain. Harkaway himself mentions they never met and the gist of his piece is that Adams was simply an influence on him. Harkaway isn’t a prolific or well-known author, though his Wikipedia entry does mention the interesting fact that he’s the son of John Le Carré, so why he was chosen for the ‘novelist’s take’ on Adams is open to interpretation. Nonetheless, his four-page essay does reveal some interesting aspects of Adams’ writing, perhaps giving the careful reader a few pointers on what to look out for as they wade through this collection. The actual novels themselves take up the bulk of the book. Some readers enjoy them all, others find the first one or two the most rewarding. Perhaps it’s the increasing complexity of the later books that makes them less easy to read than the first couple. Certainly that the first two books are based upon the original radio show and in turn spawned Adams’ own scripts for the TV adaptations that alone gives them a tightness and accessibility that the later books lack. The humour’s still there in the later books, but they’re more hard sci-fi than the preceding books, which really do read more as quintessentially English sit-coms set in space than anything else. In any event, over seven hundred pages later, come twenty-odd pages of extras. There’s an essay about canonicity by Jem Roberts, which is more an apologia for Eoin Colfer’s post-Adams ‘Hitch Hiker’s’ novel, ‘And Another Thing…’ than an inquiry into what is and what is not part of the official ‘Hitch Hiker’s’ universe. Given the discrepancies and differences between the novels, radio shows, TV series, films and computer games, that’s a shame really, but as Roberts says, the different interpretations of the ‘Hitch Hiker’s’ stories are ‘vast, messy and unreliable’. Then there’s six pages by Adams himself on the origins of the ‘The Hitch Hiker’s Guide to the Galaxy’. That’s followed by a piece of metafiction, an essay entitled ‘How To Leave The Planet’ that applies to our world but is very much part of the ‘Hitch Hiker’s’ world in tone. It’s an amusing enough squib, but too short to really amount to much. Finally, there’s a short story called ‘Young Zaphod Plays It Safe’, which concerns, among other things, some rather dangerous personalities produced by the Sirius Cybernetic Corporation. At about ten or so pages in length, it’s a fun read, with much of the usual Adams style. At £30, ‘The Hitch Hiker’s Guide To The Galaxy: The Nearly Definitive Edition’ isn’t cheap, though it certainly is cheaper than buying all five books in hardback or even paperback. But do the extra essays add anything of value? To be honest, not really. Neither the piece by Harkaway nor the one by Roberts are especially insightful, while the Dawkins introduction, while charming enough, doesn’t really tell us much beyond the fact Adams was a clever but likeable man who was interested in wildlife and good with technology, all stuff generally understood by the public at large. The three pieces by Adams have been published elsewhere, but this collection does at least bring them together with the five ‘The Hitch Hiker’s Guide To The Galaxy’ novels and that will please some readers for sure. Overall, though, it’s a collection that commends itself more in terms of value than anything more erudite or thought-provoking. « The Book Of Silverberg edited by Gardner Dozois and William Schafer (book review).